The strategic and legal sections of the Ministry of Foreign Affairs should be strengthened and developed as signing agreements prepared by foreign institutions without making a proper study could be disastrous to the country says the Member of Parliament of the JVP Bimal Rathnayaka. 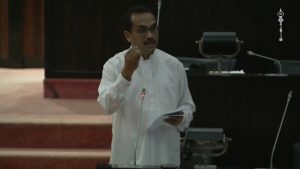 Speaking at the debate on diplomatic service held in Parliament on the 8th Mr Rathnayaka said the move by Mr Dayan Jayatilleke to carry out a political campaign hiding behind his position as a diplomat should be investigated. If this is not corrected people could find diplomats doing politics with various factions in the country said Mr Rathnayaka emphasizing that political henchmen should not be taken into the diplomatic service.